There are numerous treatments for bone spurs or degenerative joint disease of the neck, also called osteoarthritis or OA, which typically responds well to conservative care methods. According to the Merck Manuals website, OA—the principle cause of bone spurs in the cervical spine—is a chronic condition associated with joint cartilage and tissue damage, and is characterized by pain, stiffness and decreased range of motion. Bone spurs typically manifest in 40- to 50-year-olds, although neck trauma in those younger than 40 may cause early-onset joint degeneration and spurring. Cervical or neck traction is an effective treatment for bone spurs. According to the Mayo Clinic website, intermittent neck traction for a period of one to two weeks can help reduce pressure on spinal nerves or nerve roots—offshoots of the spinal cord that may be affected by the degenerative changes associated with neck OA, including bone spurs or osteophytes. Cervical traction, which involves neck elongation and the gentle separation of adjacent vertebrae by a practitioner or neck traction unit, can help reduce neck pain or discomfort, relax tight neck muscles, reduce neck muscle spasms and help balance neck and upper back muscle tone, which may itself be a contributing factor to neck OA and bone spurs. Neck traction typically requires several minutes of sustained traction before the spaces between the neck vertebrae begin to widen or separate. The amount of force or pounds used for neck traction largely depends on the patient's size and her individual presentation. Home traction units are available and used by many people with neck OA and bone spurs for temporary relief of symptoms. Physical therapy exercises may be helpful in the treatment of neck OA and bone spurs. According to the U.S. National Library of Medicine and the National Institutes of Health, OA- and bone spur-related symptoms often stabilize or improve with simple, conservative therapies such as physical therapy exercises. The Merck Manuals website states that appropriate stretching, strengthening and postural exercises help maintain healthy cartilage, improve joint ROM and bolster stabilizing muscles so that they can better absorb stress or impact. For optimal results, exercises should be performed each day, although neck exercises for cervical spine OA and bone spurs must be balanced by periods of rest. Neck exercises to reduce the effects of bone spurs should be performed in conjunction with low-impact aerobic exercise, such as walking, swimming or cycling. Neck ROM exercises are also helpful, and can be performed in warm water at an indoor pool to improve neck muscle function and reduce stiffness and muscle spasm in people with neck OA and bone spurs. Surgical intervention is sometimes necessary for bone spurs in the cervical spine. According to the Spine Universe website, bone spurs or osteophytes can protrude into the spinal canal or intervertebral foramen, which is the small hole through which the spinal nerve root exits the spinal column. 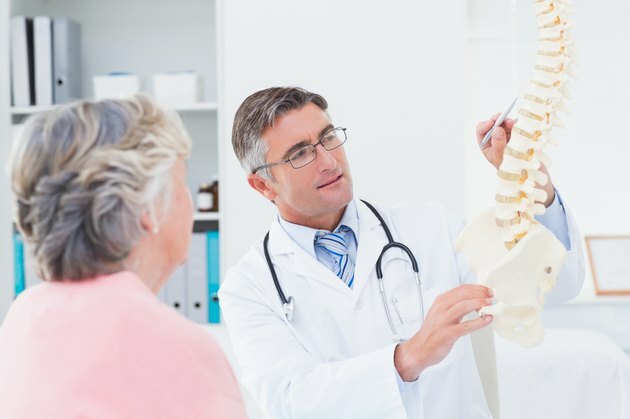 Occasionally, an osteophyte may impinge on and irritate a nerve root exiting the spine, which causes neck pain, arm symptoms such as numbness and tingling or spinal cord dysfunction or myelopathy. Symptoms associated with bone spur impingement on spinal nerve roots occur over time and tend to get worse as the compressive force on the nerve root increases. A person's cervical spine bone spurs can be surgically reduced by a foraminotomy, a surgical procedure that involves cutting or shaving away bone around the intervertebral foramen, according to the U.S. National Library of Medicine and the National Institutes of Health or NIH. The NIH also notes that other bone at the back of the involved vertebra may also be removed to make more room for the nerve root.